When it comes to investing in pots and pans people get baffled with the variety that are available in the market. This can be best avoided by getting to know your cookware better. It could be based on the kind of cooking you are more inclined into or could be based on convenience of cooking. However reading a little about Cookware Tips & Tricks can also be a way out of this problem. That is correct you can read about the details in various magazines and even in the internet now that it has become a medium to learn things as well. This will not make your cookware to last longer but can also leave you with better cooking results. 1. Using the right spatula – Many of us do not know about this that although metallic spatulas may seem to be good, but they make scratches which may turn into abrasions. Not to mention that this will corrode away within a shorter span of time. Hence using wooden spatulas can be a way out. They sturdy as compared to its other variants and can make cooking healthy. 2. 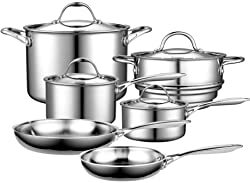 Acidic base – Never ever store acidic food in metallic pots and pans as they will react, probably it is only a matter of time before they start doing so. On the contrary collecting them in porcelain, glass or ceramic cookware can be considered to be an excellent idea. In order to know about cookware tips & tricks you need to make sure that you keep yourself informed about the latest products. This will ensure that you remain updated all the time with the recent most development relating to maintaining and storage facilities. Remember to keep your kitchen hygienic with the intention of protecting your family.